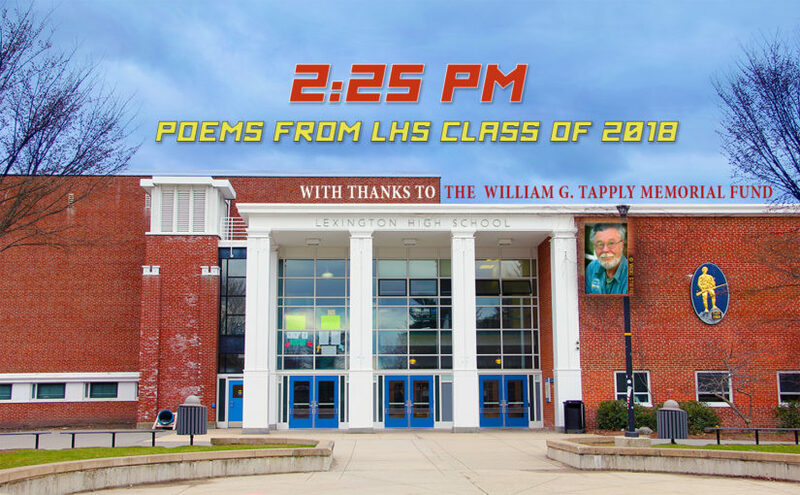 Welcome to the CLASS OF 2018 edition of Lexington High School’s online anthology, 2:25 PM, which features original poetry from over 400 LHS sophomores and is dedicated to the memory of Bill Tapply (a graduate of LHS, a beloved LHS teacher for 28 years and a successful author) and to The William G. Tapply Memorial Fund. In our sidebar you can find poems by scrolling down the alphabetized table of contents, or by doing a search directly for the author’s name or by poem category. The Student Publishing Program is proud to publish all the students here along with a poem read by former U.S. Poet Laureate Billy Collins for the Student Publishing Program’s Greatest Living Writers Project – a collection of free, on-demand video resources sharing the art and writing advice of more than 500 of America’s top poets. Click the video below to hear Billy Collins read his poem, “Introduction to Poetry,” (or click here to read just the text), and then scroll down for eight editor-selected student poems – just a few of the hundreds that resonated with us across a variety of subjects and styles, auspicious highlights of what readers can expect when exploring LHS Class of 2018’s anthology more deeply. the sternum and the spine. Her parents named her after rain. my collection of scribbles into the trash. off the trail, into the field of brilliant yellow flowers. They said that I couldn’t. You, are sweet and haunting. up, then a tri-ple-let down. with the cascade of a harp. of a galaxy around a single soul. and drawing a shard of their heart out.